Stephen R. Covey, an internationally respected leadership expert, is the author of several acclaimed books, including The 7 habits of Highly Effective People. This New York Times No. 1 international bestseller has also been on the bestseller lists of BusinessWeek, USA Today, and Publisher's Weekly for over five years. More than 12 million copies of this powerful book have been sold in 33 languages throughout the world. Dr. Covey is also co-founder and vice chairman of Franklin Covey Co., a premier leadership and professional services firm that helps individuals and organizations measurably improve their effectiveness in time management, leadership, communications and sales. 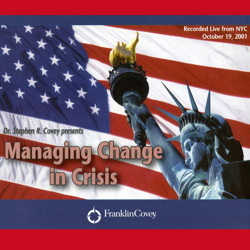 Dr. Stephen R. Covey and associates of Franklin Covey Co. hope that by offering their unique expertise, time and energy in this audiotape, that organizations will gain vital perspectives that will help them not only cope with the aftershocks of any crisis but also realign business strategies for economic recovery. It is their hope too that the insightful and empowering words of Dr. Covey will help individuals realign their personal lives around what really matters most.